I've always been very fond of this pretty little church, despite the fact that it is of no great significance in architectural or historical terms. There is something deeply attractive about it, both the building and its setting. I like Beyton too; a proper, working village, with real people's houses, but also a gorgeous village green, with its sleepy geese and mellow lime trees. Here we are in the flat country to the east of Bury St Edmunds, a land of narrow lanes and secretive villages. When I was a boy, the main road between Cambridge and the sea went through Beyton, and passing the side of the green was always a marker of being halfway there, or halfway home. Today, the A14 takes all that traffic to the north of Bury, and the geese can sleep in peace. Coming back here in 2008, eight years after my previous visit, it was all instantly recognisable. In the 1930s, Arthur Mee found the church in the grounds of Beyton Hall, but today the road up to it is lined with modern houses, presuming that the church hasn't been moved in the meantime, of course. This is one of those round towered churches that has heavy buttresses, creating an optical illusion about its true shape. So Suffolk people say "Oh, Beyton, that's the one with the oval tower!" But it isn't really - or, at least, it as round as many of the others, given early medieval techniques. 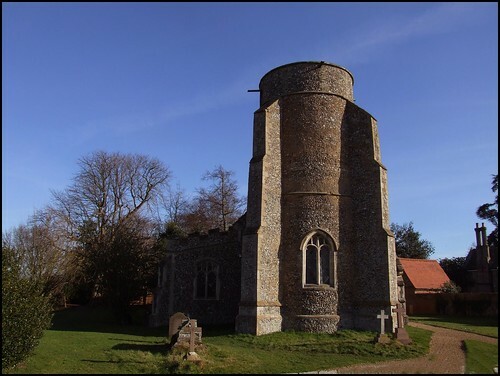 The same is true of Ramsholt, the other buttressed round tower. 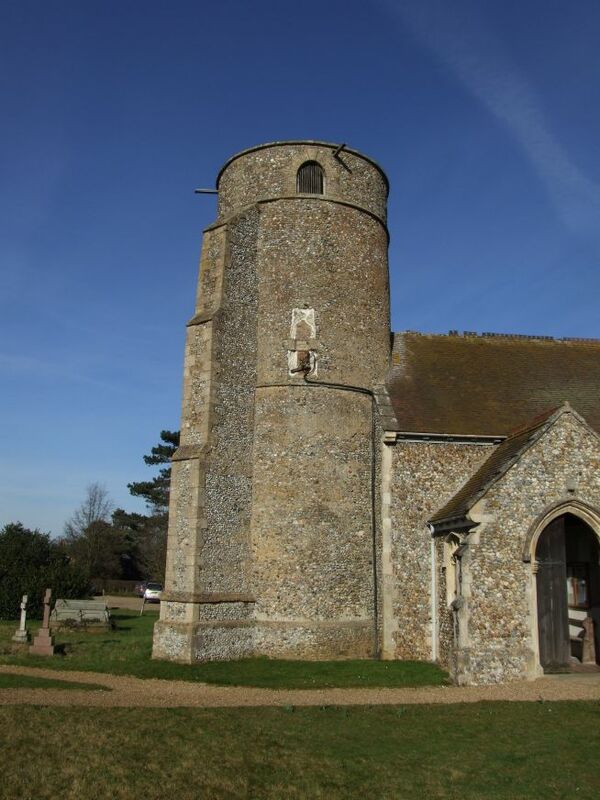 And this tower is an early one, probably Saxon. 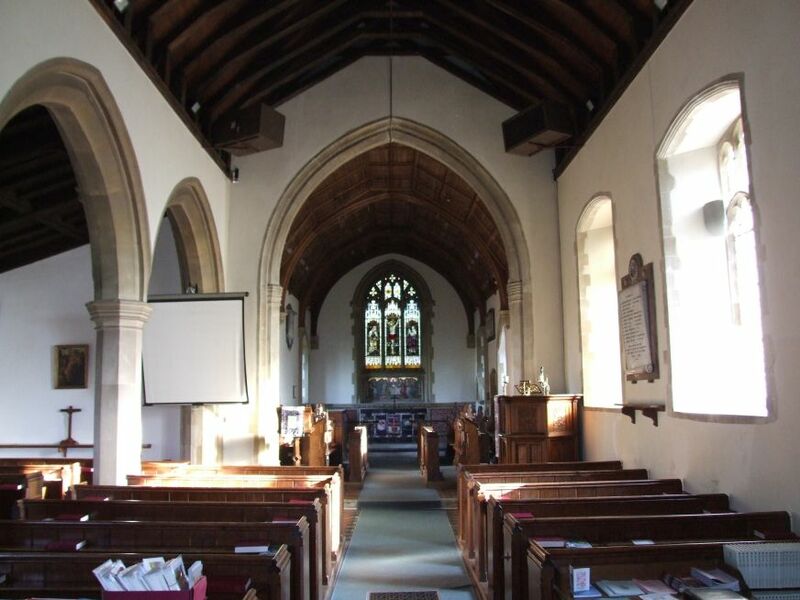 The top is 18th century, and Mortlock thought it might have replaced a late medieval bell stage like the ones at Ashby, Gisleham, and elsewhere. The rest of the church is almost entirely a Victorian rebuilding, for this church was falling down by the early 1800s. A local architect, John Johnson of Bury, was responsible for the rebuilding of the nave in the 1850s, to which he added a north aisle. 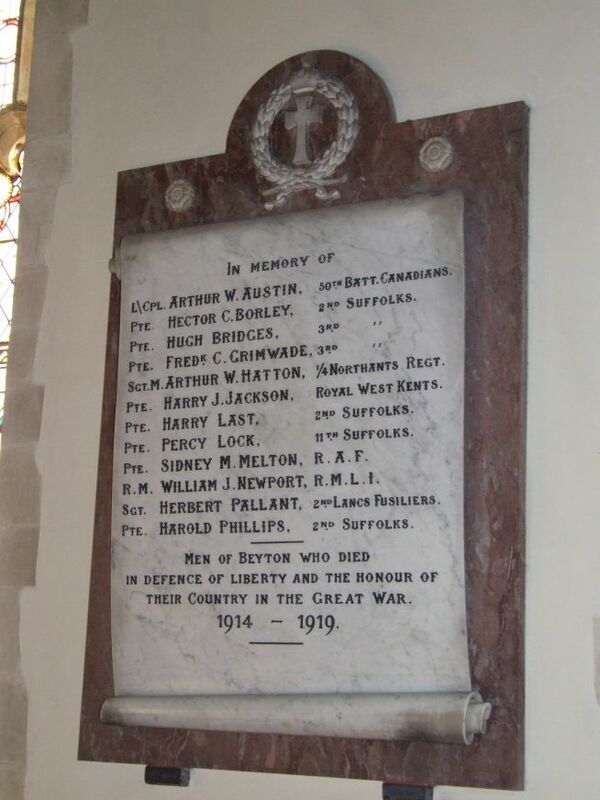 He is credited in some books with the chancel as well, but Mortlock thought it was later, and the work of the famous Sir Arthur Blomfield, whose work can be found in several places in Suffolk, most notably in his complete churches of Felixstowe St John the Baptist and Ipswich St John the Baptist. The quality and style of the work certainly looks like Blomfield. 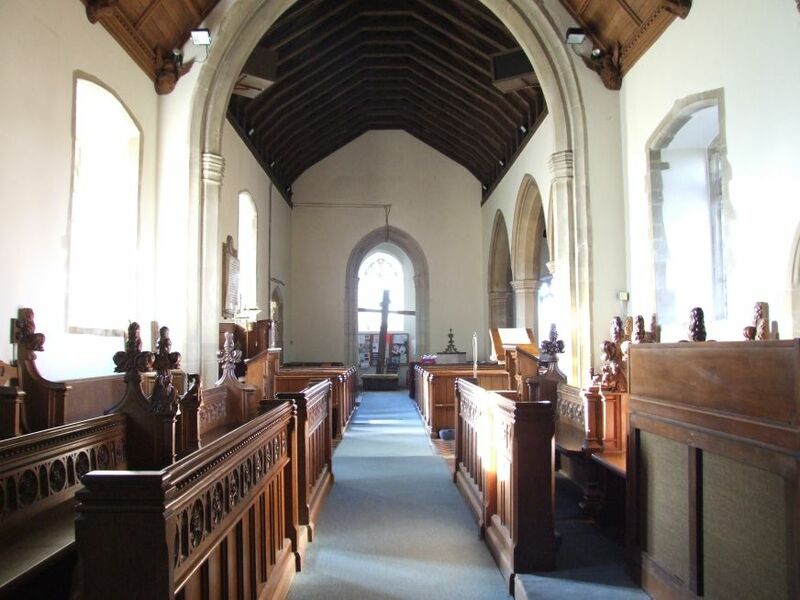 To the south of the church is a modern vestry and meeting room, in typical 1970s style. Mortlock didn't like it, but I thought it echoed the surviving medieval porch rather well. You enter this porch, and step through into the nave. The interior is of a neat, trim 19th century village church, and I can't really explain why I like it so much, except to say that it is so good at being this. 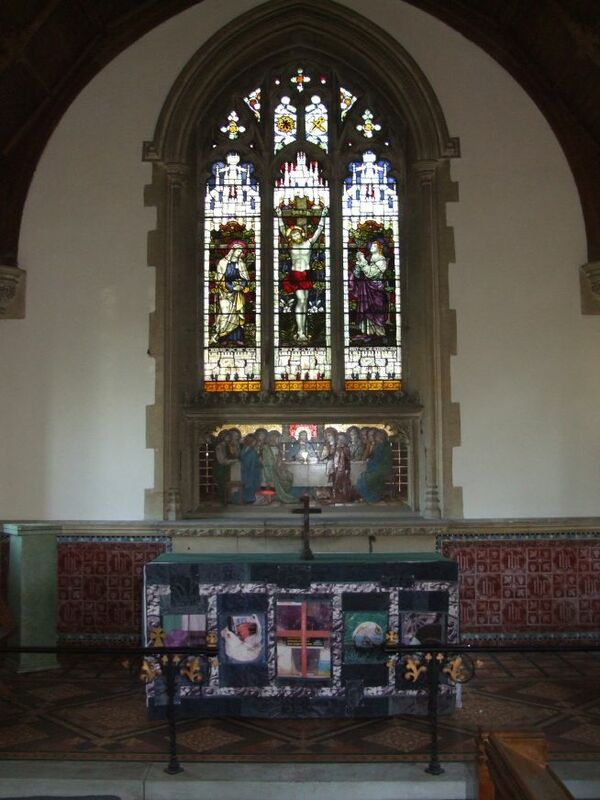 If asked to show someone a typical Victorian, rural, East Anglian interior, this is the one I'd choose. 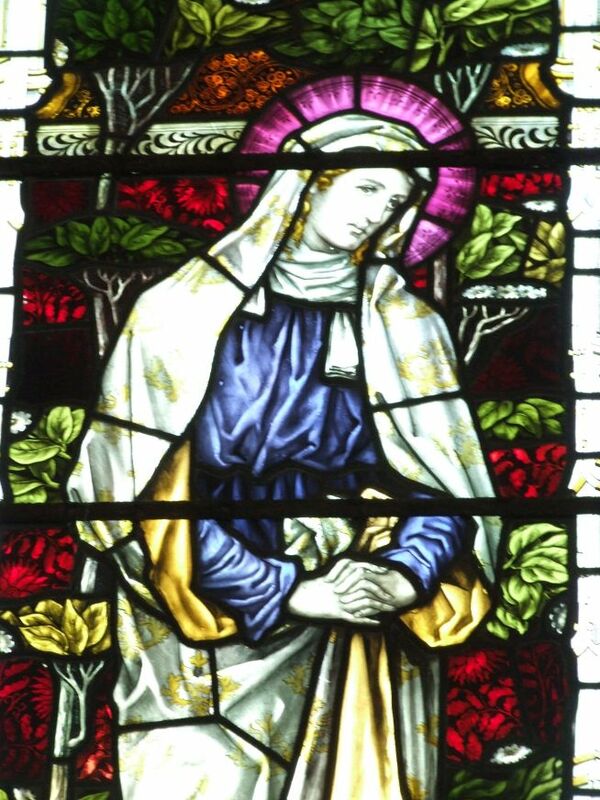 The light is suffused with colour from a couple of notable windows in the north aisle. Both are modern; my favourite of the two is the 1960s Goddard and Gibb memorial to a local farmer. It depicts the parable of the sower, and the inscription records that Frederick Hammond lived and farmed for 48 happy years. That single word makes all the difference, doesn't it. .The other is rather curious. It is the memorial to the dead of the Second World War, and features, in a vaguely expressionist style, a soldier kneeling before Christ, who says Well done, thou good and faithful servant. There are some excellent 19th century bench end figures in the chancel, and I wondered if they were the work of Henry Ringham. The highlight of Blomfield's chancel is the reredos, which Mortlock credits to the Powells studio. It shows the Last Supper with a rare lightness of touch, and is a focus even from the back of the church, which should be the intention of every reredos. Blomfield obviously designed a space for Anglo-catholic liturgical forms, and today this church is more in the evangelical mould. But that doesn't matter, because they do a splendid job looking after their heritage. And unlike many other churches in the Bury area, this one is kept open for private prayer. The puritan iconoclast William Dowsing came this way on March 1st, 1644, and ordered the levelling of the steps which had been upraised by Laudian enthusiasts ten years or so before. That is all academic now, of course, but it is interesting to note that Dowsing's deputy in this area was the scheming, illiterate Thomas Crow, who had a reputation for sniffing out 'scandalous ministers' (that is to say, theological liberals) and ensuring their prosecution. So we may assume that the minister, at least, at Beyton was not terribly sympathetic to the Puritan cause. Dowsing himself was a rather conservative, articulate chap, but some of his henchmen seem to have had the qualities of fascist thugs. Interestingly, Dowsing ordered the destruction of a gable cross, and the stump on the eastern gable of the nave looks as if it might be medieval. This would suggest that Johnston's rebuilding reused the original eastern wall of the nave, which would not be unusual. In his journal, Dowsing names this village as 'Bayton Bull', presumably after the posting inn up on the top road; he must have been very familiar with it, as he shuttled along this road regularly between the two counties that he had responsibility for. The pub survived until relatively recently, in rebuilt form, halfway between Cambridge and the sea.